Some interviews are easier than others—but not my recent interview with Yoon Jae Lee, founder and conductor of Ensemble 212 based in New York City. I reached out to Yoon Jae a while ago because I admire his great entrepreneurial spirit and his ability to curate great concerts within Ensemble 212. 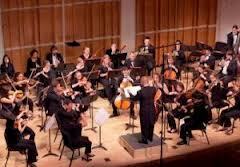 It’s no easy feat to establish a successful chamber orchestra in NYC. So I thought, if anyone has had to grapple with some of the “big” questions surrounding engaging performance today, it would be Yoon Jae. “I believe that the challenges facing “classical music” are numerous and extremely complex. Like most social issues in the US (immigration reform, health care, etc.) there are no easy answers can which solve all of classical music’s problems with the snap of a finger. However, there are many things that our generation, the young professionals, can and must do to make classical music a part of our everyday culture and at the same time enjoyable as well. I often find myself asking this rhetorical question: What is “classical music” anyway? Is “new music” (defined as a sub-genre of classical music “classical”?!? Yet, aren’t The Beatles “classical” to most in the general public? What about Phillip Glass? Labels can be convenient but also limiting and harmful as music often defies categorization. For example, is Gershwin jazz or classical? Classical music as a fringe element? I’ve got to admit that even I hadn’t thought the general consensus was that classical music was considered to be that irrelevant. However, it is an interesting point– perhaps even a truth that all of us who love and cherish this form of art need to acknowledge. It cuts a little close to home, but isn’t the first step to correcting a situation to know and understand its full scope and breadth? Yoon Jae makes a great point, one with which I completely agree, that bringing classical music back into the scope of what is culturally relevant with audiences of today should be our first priority. “I feel that music education in general needs a radical reform at all levels. I think the concept of having separate concentrations of performers and educators is fundamentally wrong. How many “performance” majors are going to be just performing and not teaching? I believe that most conservatories leave their graduates ill prepared to face the challenges described above. For me, it was only after I got out of school I realized what a perilous situation classical music and its professionals faced. If we are not given the tools to teach properly or more specifically, have the ability to relate to the general public about what “classical music” is about and why we do it, how can we expect them to truly appreciate what we do and why? The recent derogatory articles on the SF Symphony’s strike is a clear example of writers who have no understanding about our profession. I don’t blame them 100% though, I think we musicians are partly at fault for not relating what we do to the general public. I believe in what Yoon Jae Lee is doing with his Ensemble 212. The orchestra’s stated mission ” to propel the careers of young professional musicians as they develop into the finest performing artists of their generation” is aptly suited to meet the demands of a changing arts culture. Ensemble 212 does not shape the careers of performers of past generations, but rather, shapes the careers of performers in this generation. To learn more about Ensemble 212, check out their website by clicking here. If there is but one rule to follow in the performing arts, this should be it. From individual artists and musicians, to small groups, to large performing arts organizations, this rule provides insight into how just a little more effort could leave our audiences not just satisfied, but thrilled. Don’t misunderstand me. I am a professional musician and I know how much work goes into preparing even the most basic of performances. That’s why the first step to giving a little more is to stand back and take a look at all the positive and/or creative work you have done so far. Give yourself a pat on the back– because you deserve it. When you look at all the effort you’ve put forth to make great performances so far, you’ll be motivated to raise the bar and keep your momentum rolling. At your next recital, plan to perform a simple, but joyful piece as an encore to your performance. After you have concluded your programmed repertoire, surprise your audience by thanking them directly for coming and dedicating the surprise encore to them. Why does it work? The audience doesn’t expect the unplanned piece. It wasn’t on the program notes. If you say something like “Thank you all so much for spending this evening with me. I can feel your warm appreciation, and to repay you, I will perform (work title). It’s my gift to you. Thank you again, and I do hope you enjoy it”, you deepen your connection to the audience and you show your own humility. The audience will leave feeling appreciated. Divide and conquer. Take the total amount of people on your group’s mailing list and divide it equally amongst your members. Each of you will then send a personal thank you note on the behalf of the group to your portion of the list. If there four of you in the group, repeat this 4 times a year. What’s the benefit? You audience members will receive 4 handwritten notes in a year’s time thanking them for their support. They will connect on an individual level with each group member, and because of that connection, they will be more likely to build a long-lasting relationship with your ensemble. Divide the work load, put forth the effort, reap the reward together. By asking these genuine and open-ended questions, you simultaneously establish memorable moments with audience members while gaining valuable insight as to how they experience your concerts. You also fortify your audience base because the concert no longer becomes an anonymous event for them. As you can see, there so many directions to take your audience’s experience to the next level. 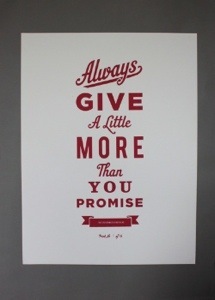 Remember, a little can truly go a long way. P.S. Special thanks to David Wallace for inspiring this post from his great work with audience engagement and always knowing how to give a little bit more than expected. Check out David’s book Reaching Out: A Musician’s Guide to Interactive Performance by clicking here.